Situated south of Bethlehem, Hebron is one of the oldest continuously inhabited towns in the world. History shows the Canaanites were living in Hebron as early as 2000 B.C.E (Before Common Era). Tradition holds that Adam and Eve lived in Hebron after their expulsion from the Garden of Eden. 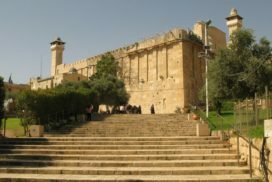 Holy to Muslims, Christians and Jews alike as the burial place of Abraham, Hebron (Al Khalil) has a fascinating history that continues to unfold until today. The Abraham Mosque, which houses the tombs of the patriarchs, dominates the city center’s landscape. Inside the mosque, stunning stained glass windows soften and transform sunlight falling upon the marble floors and stone-inscribed walls. The huge symmetric stones in the walls of this Mosque are in the style of Herod the Great. Hebron is known for its lush grape vineyards, pottery, glassware, leatherworks, and other inventive arts. Lively, colorful, and creative are the most common words used by tourists to describe the city. To the north of town are the famous Hebron glass factories, world-renowned for producing exquisite blue glass. Visitors can watch the process of glass blowing from beginning to end and choose from a colorful selection of vases, jars, and ornaments. Visitors also can find interesting pottery in Hebron, while tourists looking for leather goods will want to check out Hebron’s tanneries. Hebron is also famous for its beautiful colorful rugs. 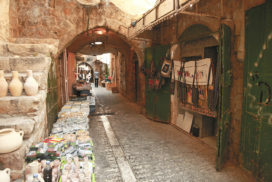 Hebron’s Souq (market) is a wonderful adventure of arched roofs, alleyways, and shops, where you can buy everything from olive wood, spices, dried fruits (the raisins are particularly delicious), jewelry, and avant-garde baskets made from old rubber tires. In step with its focus on the arts, Hebron is creating a museum for archeological and cultural artifacts in an old hammam (bathhouse). Approximately 3 kilometers north of the town center is the Beit Ilanim site, where an angel told Abraham and Sarah that she would bear a son, Isaac. Another compelling site is Masqobia, where a huge oak tree stands, indicating where Abraham invited the angels to rest and eat.